* Texture "Aerograph Clementine Full globe high resolution"
* Texture "Photographic Clementine Full globe very high resolution (500 m)"
* New Texture "Lunar Orbiter High resolution (1000 m)"
* Databases "Named formations / Near Side / Far Side", "Indiced craters / Near Side", "Historical sites", "Pyroclastic deposits" and "Indiced craters / Farside" included. * English and French versions with pictured help. 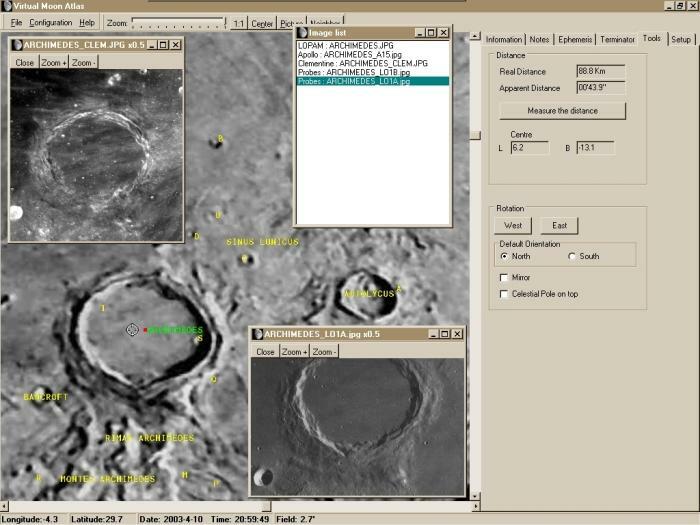 Qweas is providing links to Virtual Moon Atlas Pro 5.1 as a courtesy, and makes no representations regarding Virtual Moon Atlas Pro or any other applications or any information related thereto. Any questions, complaints or claims regarding this application Virtual Moon Atlas Pro 5.1 must be directed to the appropriate software vendor. You may click the publisher link of Virtual Moon Atlas Pro on the top of this page to get more details about the vendor.